What follows are the judge’s instructions to the jury. Read them and you will begin to understand why juries return the draconian awards the riaa is able consistently to achieve. This is an action for copyright infringement. A “copyright” is the exclusive right to copy. A copyrighted work can be a literary work, musical work, dramatic work, pantomime, choreographic work, pictorial work, graphic work, sculptural work, motion picture, audiovisual work, sound recording, architectural work, mask works fixed in semiconductor chip products, or a computer program. The owner of a copyright generally has the right to exclude any other person from reproducing, preparing derivative works, distributing, performing, displaying, or using the work covered by copyright for a specific period of time. One who reproduces or distributes a copyrighted work during the term of the copyright, infringes the copyright, unless licensed by the copyright owner. In this case, a jury in an earlier trial determined that the plaintiffs are copyright owners or licensees of exclusive rights under United States copyright with respect to certain copyrighted sound recordings, which are listed on Trial Exhibit 1 and Trial Exhibit 2, and that the defendant, Jammie Thomas‐Rasset, infringed plaintiffs’ copyrights in these works by using an online media distribution system known as KaZaA to download the plaintiffs’ copyrighted recordings and to distribute the copyrighted recordings without the plaintiffs’ authorization or a license. “Willful” means that a defendant had knowledge that her actions constituted copyright infringement or acted with reckless disregard of the copyright holder’s rights. You are hereby instructed that a jury in a previous trial has already determined that the defendant’s infringement of plaintiffs’ copyrights was willful. In this case, there is no issue as to the defendant’s liability for willful copyright infringement. As a result, your sole responsibility is to determine the amount of damages to be awarded to the plaintiffs for the defendant’s willful infringement of the plaintiffs’ copyrights. In this case, each plaintiff has elected to recover “statutory damages” instead of actual damages and profits. A copyright holder may recover statutory damages even if it did not submit evidence regarding actual damages. 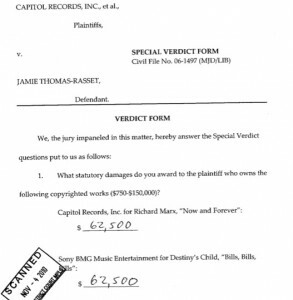 Under the Copyright Act, each plaintiff is entitled to a sum of not less than $750 or more than $30,000 per act of infringement (that is, per sound recording downloaded or distributed without license). Because the defendant’s conduct was willful, then each plaintiff is entitled to a sum of up to $150,000 per act of infringement (that is, per sound recording downloaded or distributed without license), as you consider just. In determining the just amount of statutory damages for an infringing defendant, you may consider the willfulness of the defendant’s conduct, the defendant’s innocence, the defendant’s continuation of infringement after notice or knowledge of the copyright or in reckless disregard of the copyright, the effect of the defendant’s prior or concurrent copyright infringement activity, whether profit or gain was established, harm to the plaintiff, the value of the copyright, the need to deter this defendant and other potential infringers, and any mitigating circumstances. The jury did just what it was told. There was no fair trial. If this is the jury trial the Seventh Amendment guaranteed then the Constitution needs to be rewritten.